While the Hydro-Kinetic Bio-Film Reactor is utilized as an intergral component of our Hydro-Kinetic system, it is designed to work in a wide variety of applications and is easily installed as a component of any onsite wastewater treatment system. Installation of the Hydro-Kinetic Bio-Film Reactor between the treatment tank and final disposal system significantly improves the effectiveness of the treatment process. The Hydro-Kinetic Bio-Film Reactor meets the structural requirements of IAPMO/ANSI Z1000 and has the capacity to treat up to 800 gallons per day. 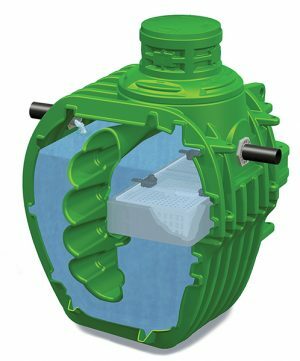 The rotationally molded polyethylene reactor is lightweight, weighing less than 500 pounds. Completely non-mechanical, the Hydro-Kinetic Bio-Film Reactor is user friendly, easy to install and maintain. Producing superior effluent quality, the Hydro-Kinetic Bio-Film Reactor can extend the life of the disposal system while meeting or exceeding the most stringent regulations.